The coastal town of St Mallow is a peaceful place, until property speculator Clive Pothecary is found one night in his car, dead. He has been strangled by a cord but the marks on the body are what makes the case stand out. Someone has carved the seemingly meaningless word “BOUSTRAPA” into his forehead. and that’s exactly what you get here. It’s all written with charm and Bathurst is pleasant company. That’s a good job, as we stay in his company for most of the book, except when we check in on the residents of St Mallow who, I suppose, should charitably be referred to as suspects, but it’s only after chasing halfway round the country trying to figure out who Pothecary was that we actually start considering who killed him. We also get to see him sort-of romance one of the suspects, although he seems to forget about her halfway through and starts chatting up one of the police characters. A girl staying along at a Bed and Breakfast is so rare that only one of the hostelries in the area had a solo female guest in the past six months. Strangling from behind with a cord is an method so obscure, there is an early theory that it was a Thuggee execution. Ross-on-Wye, a small town, can be effectively ruled out of being the town that Pothecary came from by asking one fairly mad old man who “knows everybody” in a town of population over 9000. World War II is referred to as “the big scrap”. A woman is referred to as well-endowed – meaning rich, obvious. What did you think Flynn meant? The phrase “fore-name” was beginning to be used to replace “Christian name” – and is, according to Bathurst, “a ghastly official travesty of a beautiful adjective”. Anyway, a fun read, but not something that is ever going to win a “Best Book Ever” award. Well Worth A Look. I have to commend the singlemindedness of purpose that you adopt when you uncover these gems, Doc — you’re going great guns on Flynn and Rhode/Burton, and bringing some great classical book for us to snap up (and not-so-great ones to avoid) should we get the chance. Hugely appreciated, many thanks! I love the things you point out about how times have changed… well-endowed, indeed! Thanks so much for reading this one – very efficient service this blog runs! I think on balance I might avoid getting this book. The price wasn’t that good and I do like my characters developed (picky I know). Does sound quite funny though given the sociological facts you list. 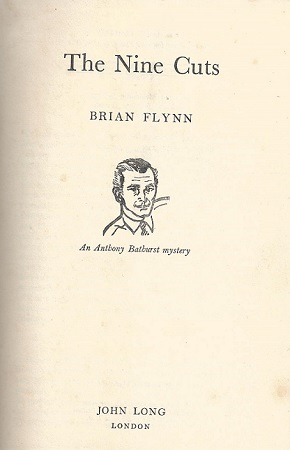 I’ll try and remember to bring one of the better Flynn books to Bodies for you to try. Yay! Very kind of you and I’ll make sure I remember your Rhode books.